Whether your organization is new to virtualization or you've been deploying it for years, the reality is that virtualization is a technology that should be a strategic part of your business, now and in the future. 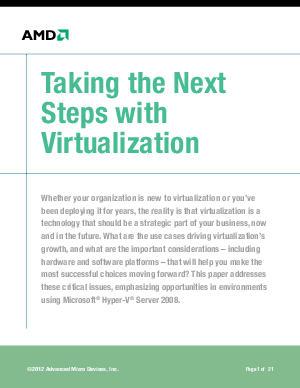 What are the use cases driving virtualization's growth, and what are the important considerations - including hardware and software platforms - that will help you make the most successful choices moving forward? This paper addresses these critical issues, emphasizing opportunities in environments using Microsoft® Hyper-V® Server 2008.